AUSTIN—Wearables that deliver notifications and only notifications really need to justify their existence, since, let’s face it, it’s really not that big a deal to just wait until you pick up your smartphone to see who called or texted you. So to succeed, products need a fun design that you’d actually want to wear, good battery life so that keeping them charged doesn’t become a chore, customization so you get only the notifications you really care about, and a low price point because... duh. 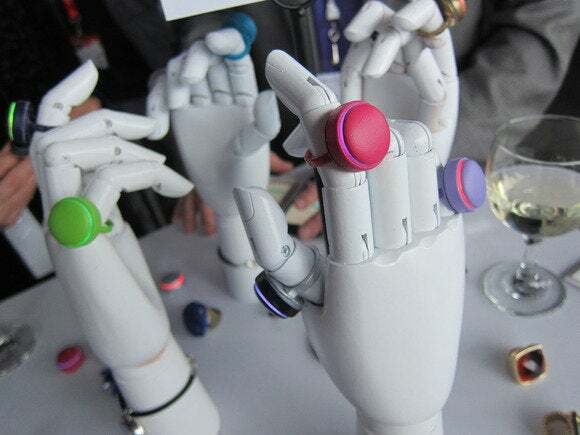 Ringblingz, shown off at the R/GA accelerator’s demo day at South by Southwest, hits all of those pitches out of the park. Aimed at teenagers, Ringblingz is a fashionable wearable accessory that comes as a ring, a pendant, or a bracelet. It’s got a vibration motor and LEDs, and connects to your iOS or Android phone with Bluetooth LE. The companion app lets you set up your network—just pick the people who are important to you, and assign them a color. Your best friend can be red, the boy you’re crushing on could be purple, whatever—the LEDs can create 300 colors in all, so your network can get pretty ridiculous before you run out of colors. The mobile app that accompanies Ringblinz lets you turn on different social networks for each person in your contact list. For each person in your Ringblingz network, you can toggle on or off different social networks: Instagram, WhatsApp, Snapchat, Twitter, Facebook, texts, and even old-fashioned phone calls (as if). Activity on those networks causes the ring to flash that person’s color and buzz with custom vibrations—adios, FOMO. Fashion-wise, the Ringblingz is fairly basic on its own—small enough to blend in with your outfit, with the ring of colored light giving it some neat, techy flair. The company will partner with designers like jewelry maven Debra Shepard for funkier designs, as well as let you customize your own 3D-printed creations with help from Makerbot and Shapeways. Raul Peñaranda even included Ringblingz in his runway show at last month’s New York Fashion Week. The Ringblingz runs on a coin-cell battery so there’s nothing to charge, and the company promises free batteries for life. Thanks to Bluetooth LE you shouldn’t have to change them much, but it really depends on how many notifications you have, you popular so-and-so. And with a price point of around $40 to $60 for each Ringblingz, losing one would be a bummer but not a tragedy. Ringblingz is one of the best-looking wearables we’ve seen so far—OK, that’s not such a huge hurdle to clear, but still—and targeting connected teens is a stroke of genius. At the risk of dating ourselves, it’s quite possible that making someone’s Ringblingz network will be as important as making someone’s top eight friends on MySpace used to be. You know... back in the day. Hopefully, the company can keep up with teens’ fickle taste in messaging apps by updating the Ringblingz app to support the newest social hotness. Available as a ring, pendant or bracelet, Ringblingz flashes a particular color when someone in your network is trying to reach you. Preorders start soon, and those units are expected to ship this summer, with full retail availability in the holiday season. This is definitely one to watch, and we’ll have a full review once we get one on our fingers. This story, "World's smallest wearable Ringblingz is coming for your teenagers" was originally published by TechHive.